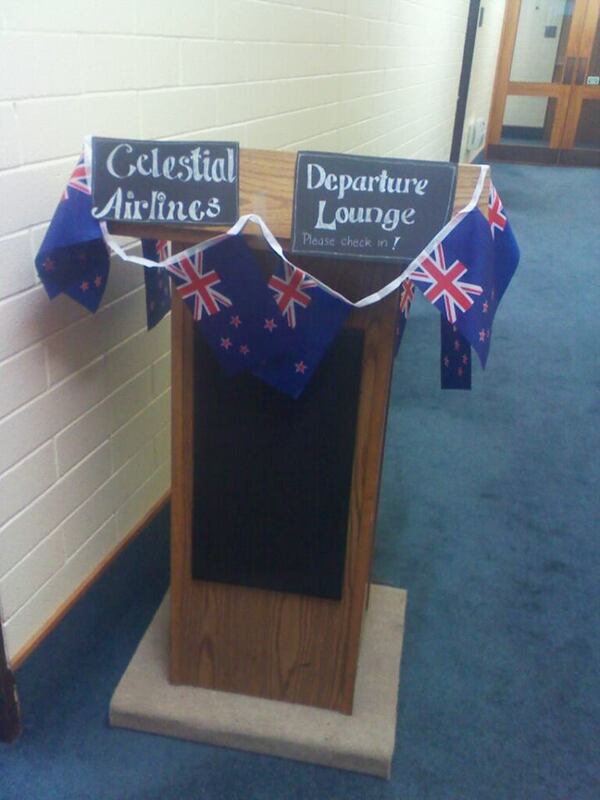 Faith in God - Lds Activity Days: I hope they call me on a mission - Celestial Airlines flight. I hope they call me on a mission - Celestial Airlines flight. So this is an update on the activity we had - The first of the "Hope they call me on a mission series"
We started our flight with a prayer - because all traveling should start with a prayer...Right! I explained the night as shown in my previous post, and talked a little about the Faith in God Programme and how our journey through life, and through this programme requires a team effort.... us, our parents, our primary leaders and Heavenly Father. Explaining that tonight they would be working as a team with their parents on this journey too. We also talked a little about how Heavenly Father loves all of his children all over the world, and wants them all to know of his gospel, and one way we can prepare to share is to learn about other cultures and languages. We divided the room into two flights.... an air-hostess was going to take each group into the hallway, line them up - arms out (like wings) and we flew around the block of classrooms to end up at the country we would be visiting ------one room was Brazil, one was Japan. Each group spent 20 mins at their first destination and then flew in the same way to the next (swap). IN BRAZIL - My other lovely Activity day leader is from Brazil, so along with her son, they set up a matching game of words in Portuguese that related to the gospel. The kids and their parents had to look at the words in english and portuguese and see if they could match them - some were very easy to match... others not so. With each match they learnt how to pronounce them correctly. She also told them a little about where they were born and the temples in that area. Each child got to take home their own matching game of words with pictures. - I will try and attach the picture files for you if you would like to use them also. The next destination was JAPAN - One of the fathers of the boys served a mission in Japan, so he shared a little about the culture, his experiences, some basic greetings, a prayer and taught them how to make a simple piece of origami. After each group had visited those two countries we all flew back to the "depature lounge" where parents and children were put into teams and given an amazing race quiz. All questions related to things they had "seen or heard" at the two countries just visited and some things related to decorations in the departure lounge. We had a world map with each of the 26 missionaries serving from our stake on it, a poster with country flags, faith in God books, article of faith posters etc. They had 10 minutes to find as many answers from any of the rooms.... we then calculated the points... highest points recieved a trophy and treat. We ended the night with a variety of foods from the countries visited including sushi, and a sweet treat from Brazil "brigadeiro".